Today is 5 Minute Snack Day! With Football Season in full swing, Baseball post-season coming, as well as Hockey, it’s a Sports FAN-atic Season! This 5 Minute Snack is going to be the HIT of the Party! I know it will. I got this idea from a Party I recently went to! 1. Wash the Cherry Tomatoes and cut them in half. 2. Take half a Cherry Tomato & stick it on a toothpick. 3. Add a cut piece of Mozzarella Cheese to the same toothpick on top of the tomato. 4. Add a piece of Basil Leaf on top of the Mozzarella. 6. Sprinkle some Sea Salt on top of the Caprese Sandwich. 7. Stick the entire toothpick in your mouth and pull off the Caprese Sandwich. 8. Chew well & Enjoy! Cherry Tomatoes & Mozzarella is another food marriage, made in Heaven……..AND……is Healthy for you too! Tomatoes are rich in Vitamin C, Potassium & LYCOPENE, the Anti-Oxidant that gives Tomatoes their Rich RED color. Lycopene Fruit & Veggetables are my Favorite….because they are part of the Weight Loss Nation “Pac Man” Family……which will Search, Fight & Destroy Bacteria, Viruses….and Anti-Oxidant Cells that can cause Cancer. Eating Tomatoes may reduce your risk of Cancer and Heart Disease…..AND help Fight off Illnesses! Mozzarella Cheese is high in Protein, Calcium & Vitamin B12. Mozzarella may also decrease Heart Disease risk by raising your levels of HDL Cholesterol, which is the “beneficial” cholesterol in your body. This Delicious “Caprese” Mini Sandwich Snack…… ALL 8-10 of them, is only around ……. 200 calories! You have to like that Nation! You will LOVE this SNACK! Bring Mini Caprese Sandwiches to EVERY Party or Event you go to this Holiday Season. It will be a Major Hit! Want to learn more about Weight Loss Nation? 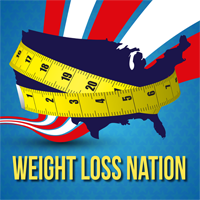 I would love for you to take a few minutes and give Weight Loss Nation a Rating & Review on Apple Podcasts or Stitcher. it helps others find Weight Loss Nation.